Jim Bennett, longtime DC funk, blues, bassist scores with a previously unreleased pt. 1 & pt. 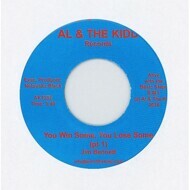 2 release on Al & The Kidd. Baseline riff very similar to another Al & The Kidd release E Flat Boogie, also recorded around the same time 1980-81.